TLC Book Tours will be sponsoring a blog tour next month. Meanderings and Muses is going to play. And guess who the guest is going to be?! Author of The Boo, The Water is Wide, The Great Santini, The Lords of Discipline, The Prince of Tides, Beach Music, My Losing Season, and The Pat Conroy Cookbook: Recipes of My Life. 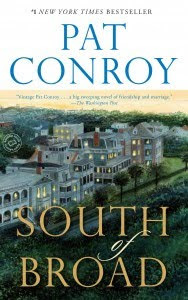 Most of you already know what a huge Pat Conroy fan I am and have read my earlier blogs squealing about him, and about his work, so I am quite naturally tickled pink about Meanderings and Muses being one of the tour hosts. Tickled pink?! Hell Honeys, I am over the moon. And if you'll bear with me, please, I'm going to repeat my Pat Conroy story. Cool that we'll be a part of this blog tour? VERY cool! Unfortunately, Mr. Conroy is too busy to really participate in the tour by writing guest posts. And that makes me kinda sad. But. There is a very slight possibility that he might be available to answer questions. I'm not sure I'd count on this, but it's lovely to think it "might" happen. So drop by on Wednesday, April 7th and leave a comment, then cross your fingers and click your heels and wish on a star and who knows, maybe Mr. Conroy will pop in and respond. Well, it COULD happen! Right?! GOOD NEWS is that I'm able to offer a give-away to those of you who stop by and leave a comment at Meanderings and Muses on the day of our event. So, if you'd like your name entered in a drawing for a trade/paperback copy of the book to be sent to you by the publisher, please stop back on Wednesday, April 7th. Remember, please, to include your email address with your comment. (Random House will ship to US/Canadian addresses only). A little about SOUTH OF BROAD. My own paltry attempt at reviewing SOUTH OF BROAD will be here on April 7th. In the meantime, visit Mr. Conroy's website - there are a couple of very interesting video interviews, descriptions of all his books, and other fun things to be found there; including a guest book you can sign. Well isn't that cool! Good for you, Kaye! Congratulations on participating in the tour. Sounds great. Love the story of you meeting Mr. Conroy. Sounds like an interesting book. I'll be sure to check out your review of it.